TOOTHWALKERS: GIANTS OF THE ARCTIC ICE presents extremely rare under-the-ice footage that reveals a complex and potentially dangerous side to this huge and often mysterious mammal. 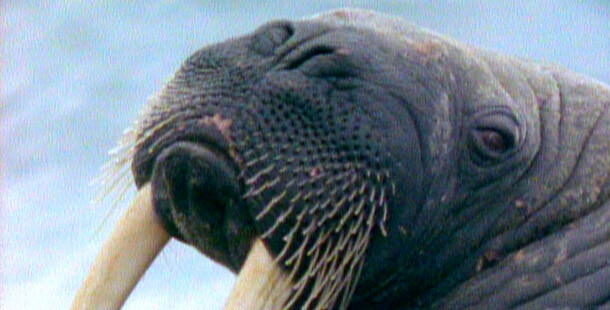 Filmmakers Adam Ravetch and Sarah Robertson, who are husband and wife, have been studying the giant saber-toothed Arctic walrus for five years. To put his diving skills to use in learning about the walrus’s other existence — the one hidden deep below massive sheets of ice — Ravetch and Robertson accompany an Inuit hunting party in its arduous and hazardous quest for the food that will carry the Inuits and their dogs through the winter. Clumsy as the walrus appears to be on land and ice, the animal is a majestic and extremely formidable creature in the water. The Inuits have learned this from experience — more than one hunter has been attacked in the water from below and dragged to his death in a crushing embrace. Thirteen Online is a production of Thirteen/WNET New York's Kravis Multimedia Education Center in New York City. Anthony Chapman, Director of Interactive & Broadband. Bob Adleman, Business Manager. Carmen DiRienzo, Vice President and Managing Director, Corporate Affairs.